Evelyn came to visit her grandmother. Grandmother Me. Evelyn is two. Evelyn’s parents were comfortable with her still sleeping in her Guava. Well, she doesn’t sleep in an actual guava. She sleeps in a Lotus when she visits. OK. She sleeps in a Guava Family Lotus. It’s a…a…fancy Pack ‘n Play. It seemed sturdier to me, when I purchased it for her brother. It has served well for visits. Anyway, Evelyn’s favorite stuffie is not something handmade. It’s a doll. Sort of an odd doll, actually. She goes by the name of “Baby” or “Baby Doll” or sometimes “Doll Baby.” Whatever you do, do not even think of separating Evelyn from Baby. The Guava Lotus looked a little empty for a just-turned two year old. I thought Baby might like a pillow and a blanket. So I knit them. The blanket is actually Dishcloth Diva Deb Buckingham’s pattern, Neutrals. Baby’s Neutrals is hot pink though. It suits her better. And the pillow is just a two motif, folded-in-half Neutrals. I had a little extra time waiting for the young ones and their parents to arrive, so I added a teddy bear for Baby to sleep with. 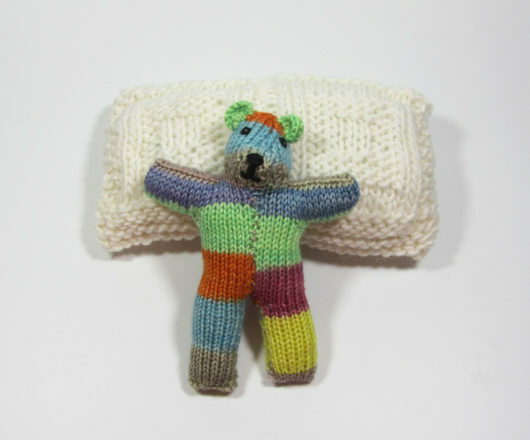 This one is a teeny version of Lesley Anne Price’s fine pattern, “The Bears.” I knit him with leftover sock yarn, Quaere Fibre‘s sportweight, in the Spring Flowers colorway. You just never know when those little bits of leftovers can come in handy. 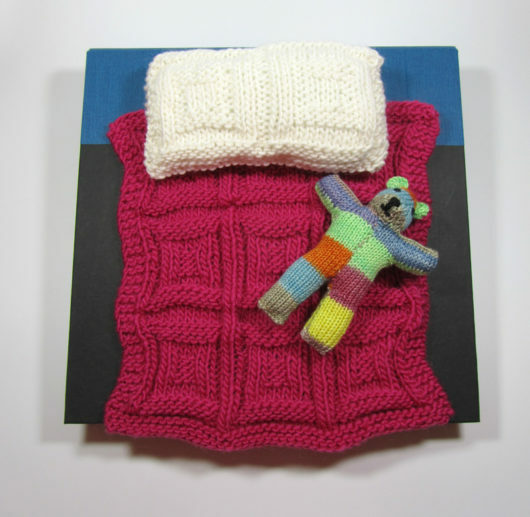 I knitted Teeny on size one needles. One leg is the width of a U.S. dime. So, very very teeny. Baby only seems to have eyes for Evelyn. Baby ignored her new bedding and toy. But Evelyn was quite taken with this little set. She mostly kept them in her Guava Lotus. During Evelyn and her family’s week-long visit, I regularly found Teeny tucked under his blankie. 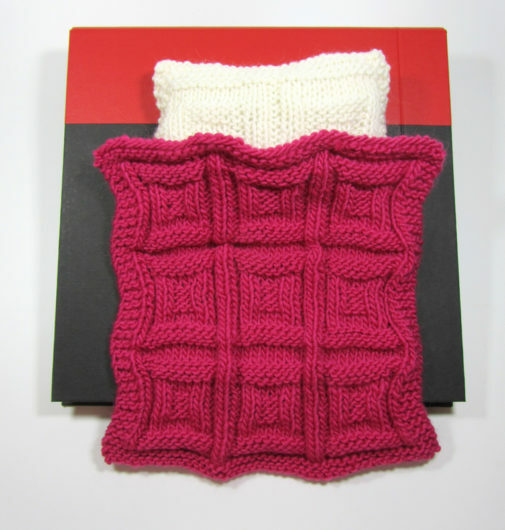 Teeny couldn’t quite get the hang of the pillow thing, but all told this grandmother declares her knitting effort a success. These female Mallards moved off from a group of about 50 female Mallards that have been sunning themselves on the skinny beach near the cut-through at the island in the lower lake. The big group is making a bit of Long Lake history. A group like this hasn’t been seen at least in the dozen years we’ve been on the lake. The group sits, splashes about, dabbles around, and just generally does all things duck all day long. Very weird. It seems like they should have someplace to go by now. These three seemed to be practicing their yoga asanas. When the females are in the water that cobalt blue patch isn’t seen. Nice of this individual to stretch enough to give us a good view. Mallards are very vocal ducks, especially the females. In fact, they are one of very few ducks that actually quack. 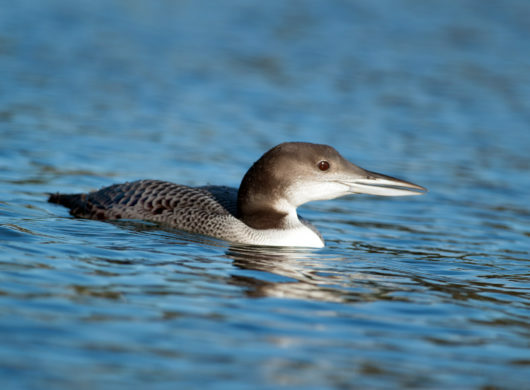 The adult Loons left the lake in September, early September we believe. And we’ve decided not to worry, but there seems to be only one adolescent loon left on the lake. The sibs hung out together, for the most part, in the first weeks after mom and pop flew south. But now we see only one. One of the chicks was a bit smaller and we’re hopeful this one is just playing it smart, bulking up for the long flight south. On October 14th, this adolescent approached our kayaks within about 15 feet. Steve took his photo. We paddled into Ghost Bay and this guy paddled in too, calmly floating near us, diving, and then resurfacing close by. We’ve not heard any vocalization. I guess when there’s no one to talk to, a loon just keeps their own counsel. We will worry if this guy isn’t headed south in the next 2-3 weeks. 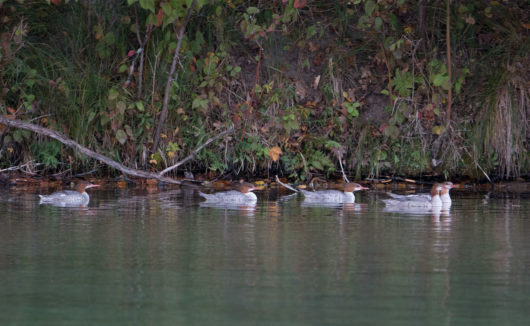 Common Mergansers are back on the lake. 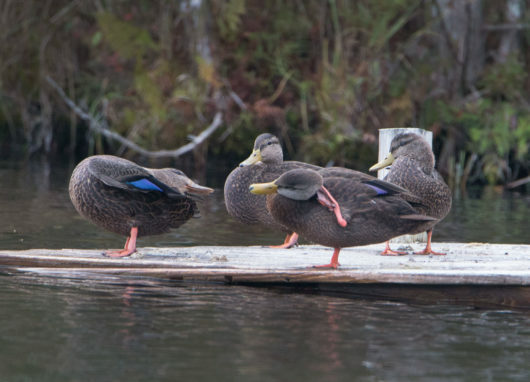 As with the Mallards, we are seeing only females. We’ve been seeing them in small groups swimming in the shallows. They dive and come up with mostly major sloppy stuff spilling out of their bills. Or they come up empty. For no reason we can discern, they are prone to episodes of water scooting.They flap their wings, flap their feet, rise up just a few inches off the water, and scoot ten or fifteen feet. They are the slapstick comedians of the waterfowl world. This trio of females was a real surprise. They are Surf Scoters. They aren’t rare. But we’ve never seen them on Long Lake. From a distance, we thought they were American Black Ducks. But then those two white patches on the sides of their heads caught our attention. And then we noticed their spectacular large bills. 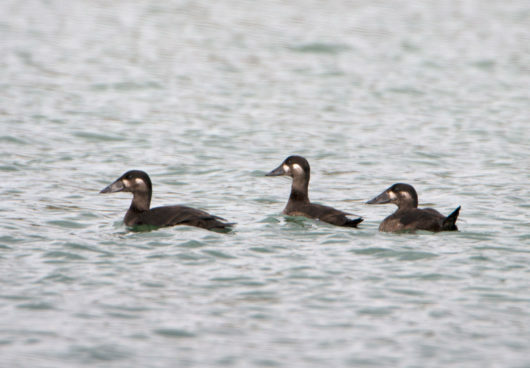 A Surf Scoter’s scientific name is Melanitta Perspicullata, which basically means Black (duck) Spectacular. Someday I hope to meet a male Surf Scoter. His bill is even more bulbous than the female’s. And, instead of dull gray, his bill is white, yellow, and red, set off by a white forehead outlined in black. Now that’s spectacular! 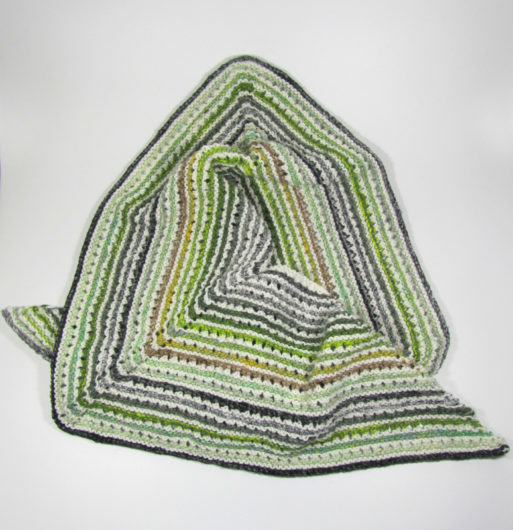 This is the Staying Put Wrap, an Erica Kempf Broughton pattern available on Ravelry. It first caught my eye because, well, because it did. 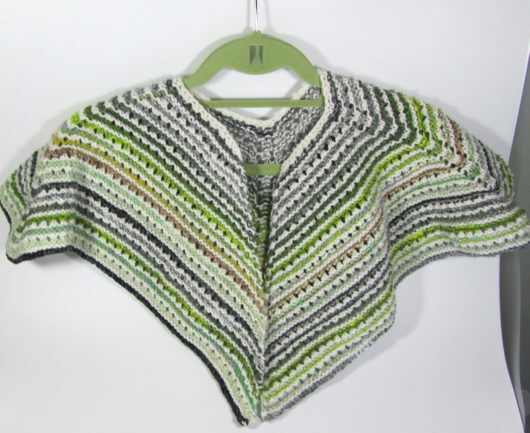 I thought it was pretty and I liked the idea of a small shawl that would stay put. 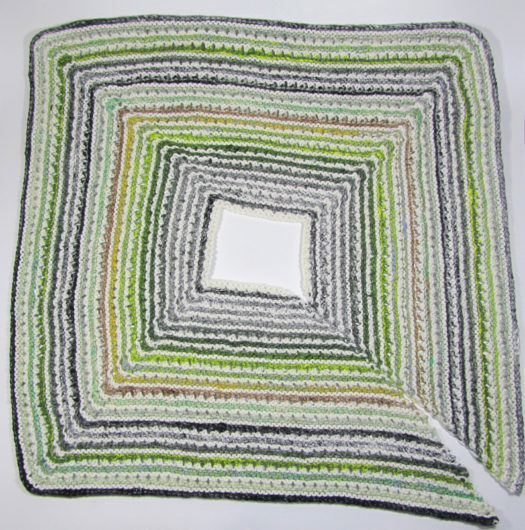 It didn’t hurt that the color-changing yarn called for by the pattern is Noro Taiyo, an Aran weight. 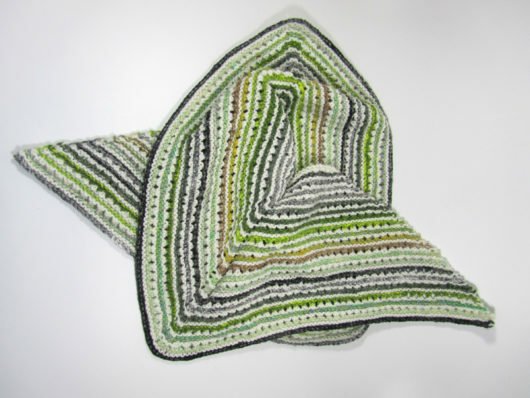 I’d had one skein of this in my stash for a few years and hadn’t found the right pattern for it. It was a single skein relegated to the sale bin. It sort of followed me home. And the other yarn needed to be a worsted. But which worsted and what color was a difficult choice. I chose an old stand-by: Plymouth Yarns Worsted Merino Superwash Solid. And, as you see, I decided to tone this down a bit so I used an off white. I am very satisfied with the way the yarns played together. Here’s a look at how nicely this wrap sits on shoulders. Pretty cool, actually. Pretty thing. And it was also a fun, quick knit.